You are sick and tired of civilization, city vanity and everyday efforts? Choose a chance to spend Your time face-to face with nature, fresh air, intoxicating wind… And do not forget the words of Winston Churchill : “Any second spent in a saddle isn't lived in vain, and only astride horse we feel the real freedom”. And You can understand the truth of the words during our tour. 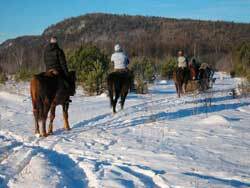 And also You climb up to the beautiful Ural mountains – Jalangas, Malinovaya, Inzer rocks, swim in the lakes and rivers. Brave enough can try to pour over itself spring water. You loose the dust of city streets and city spirit goes out from Your body… And You indeed can take pleasure watching horse behavior, their relations… And to the end of the tour You learn to hear their requests and their expressions. Meeting in Beloretsk (railway station). Arrival to tourist base. Breakfast, sauna – on Your wish. Acquaintance, instructing, Acquaintance with a harness, training to skills of riding. Trial riding walk. Lunch. Transfer to a stationary camp on the lake of Galamit - 2 km. from base. Dinner. Day time on mountain Jalahgas. Free riding over the wood glades and paths . Transfer to Galamit lake (15 rm). Swimming in the lake. Walk to Malinovka fro sauna (pedestrian or on the cart) – 1,5 rm. Spending night in the tent camp near Galamit lake. Horse walk to Inzer rocks. Horse walk to the rocks Stolby (columns). Dining 3 times-a day .Natural non-polluting foodstuff – fish, meat, milk, Sour cream, cottage cheese and marching meal: porridges, soups, canned food. At the route the tourists cook themselves. In the - professional cook.. 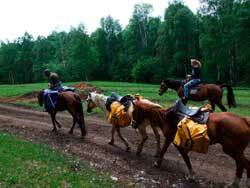 The standard: at the route tourists saddle and unsaddle horse by themselves, take away and result it from a pasture (around 200м. ), put and remove tents, cook food. The instructor helps to make all it correctly. In a campaign of a horse go with bags. Variants with horse-drawn and auto-support are possible. Number of persons in the group: 4-14 persons.